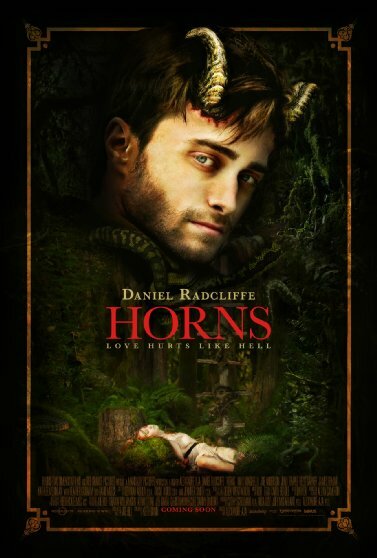 Based on the novel of the same name by Joe Hill, Horns explores many different things, starring Daniel Radcliffe as a young man struggling with life, himself, and the people around him. It doesn’t take him long to figure out that the mysterious horns have a certain effect on people. Not only is everyone suddenly very keen on sharing their darkest thoughts and secrets with him, the I-wish-I-never-had-this-child-thoughts that they’d normally keep bottled up inside –, they are also very susceptible to anything he might suggest. Armed with these handy paranormal abilities, he goes on a quest to discover the truth about his girlfriend Merrin’s (Juno Temple) death, aided by his close friend and lawyer Lee (Max Minghella) and his brother Terry (Joe Anderson), who appear to be pretty much the only ones to believe that he is not actually the murderer. Despite Radcliffe’s passionate and original performance, Horns attempts to do many things at once, and throws even more at your face just in case it might be needed later on. Indeed, there are many funny moments in the movie, and the whodunit-style of the narrative keeps you on your toes, leaving you to form your own suspicions as Ig uncovers more and more parts of the ugly truth. But the appearance of the horns and the supernatural side of the story soon take over, and you are torn between a sympathetic reading of the characters, a religious interpretation of it all, or whatever else might pop into your head at any given time. None of the characters are truly ‘good’ – they are all helplessly flawed, but in giving in to their flaws, they reveal what it is that makes them really human. Ig, however, seemingly undecided whether he should do a proper investigation or simply go on a revenge rampage, tends to even take it out on everyone else ‘for the sake of teaching them a lesson’ – and in his eternal wisdom, of course, he gives them a chance at redemption too while he’s at it. The whole structure of the narrative, reality intersected with illusion and flashbacks, is quite intriguing, and while of course it is not highly original, it serves the story well. The script, however, probably could have used another read-over or two. While the movie is still attempting to make up its mind about whether or not it should truly be a horror or a religious story, the visuals tend to be just as shaky until the film actually has found its voice. The darker the undertones of the whole story become, the more you get sucked into it, still trying to figure out what the hell it is all about. Nonetheless, there are a lot of different things at stake in the movie – and when they all come together in the end, you may just be left to shake your head. While all this sounds rather negative, Horns can still be an enjoyable experience because it does deal with an interesting story that benefits a lot from the acting. It may not be the best movie out there by far, and it’s probably best to be left for a fun evening with your friends, but it does leave you thinking – sometimes. And once you get over all the weird things that happen, it really doesn’t sound all that bad after all.